This article is part two of the overview on some of the fabled, 2015 Chevy Colorado Class Winning and Leading Technology and Stuff. If you are instead interested in browsing our rapidly depleting inventory of Colorados you can also do that here. To see the video or if you missed part one, click here to go to 2015 Chevy Colorado Class Winning and Leading Technology and Stuff part 1. 2015 Chevy Colorado Class Winning and Leading Technology and Stuff part 2 . In Part 1 we touch on several of the 2015 Chevy Colorado Class Winning and Leading Technology and Stuff that Rikk Wilde tried to help make people aware of. This, is more on that. How does so much Class Winning and Leading Technology and Stuff fit in here!? Colorado has a bold, upright instrument panel with large instruments and a Driver Information Center clearly visible in the center. The buttons and switches are strategically placed on the instrument panels and center stack. The steering wheel has all the important controls located right at your fingertips. The interior has a very car-like feel with great quality soft touch surfaces and excellent ergonomics. The front (and rear on Crew Cab models) headliner is sculpted to allow more headroom for taller individuals. The seats have gotten a lot of criticism at first-glace because they are very different than most you’ve probably ever seen. However, once you take the time to sit and experience the dual-density foam and tough, stain resistant seat trim materials you’ll realize they’re built for comfort and durability that lasts the life of the truck. You’ll also experience exceptional interior storage with the large glove compartment, rear under-seat storage and spacious center floor console that even comes with two unique, non-skid spaces for you to place your mobile phone so it doesn’t take up a cup holder. The rear of the front seats are sculpted as well to open it up and provide more leg room. 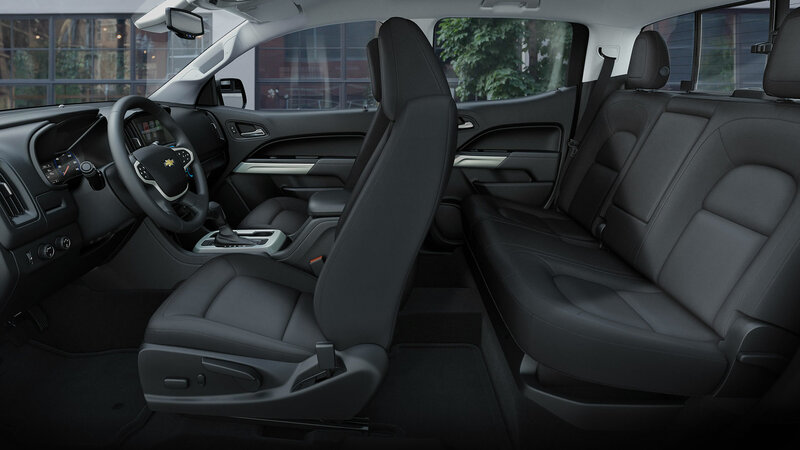 Seat corners are designed to aid in entry and exit of the vehicle without sacrificing comfort. What all this leads to is interior dimensions similar to other vehicles with one very notable exception: Legroom. With the 2015 Colorado Crew Cab you’ll get 45.0″ in the front and 35.8″ in the rear which is vastly superior to competitors. There are two different MyLink radios available for the Colorado. The basic 4.2″ Diagonal Color Screen is available on the Work Truck (WT) and has an AM/FM Stereo, USB Port and Auxiliary input jack. The upgraded 8″ Diagonal Color Touch Screen has several smartphone inspired enhancements. Gesture recognition such as flinging, flicking, dragging and swiping. Siri Eyes Free which allows compatible iPhone users to access Siri with a simple touch of the push-to-talk button on the steering wheel. Both radios have Bluetooth streaming audio for music, hands-free smartphone integrations, Pandora and voice-activated technology. This is the feature that Rikk Wilde sped through really quick. Let me give you the slowed down, comprehensive version here. As Rikk Wilde noted, your Colorado can become a rolling Wi-Fi hotspot with several distinct advantages over your traditional mobile hotspot. This provides an oftentimes faster and more reliable connection than your smartphone‘s native network with the use of OnStar’s powerful antennae which will connect in places your smartphone normally would not and is powered by your vehicle so you’re not rapidly draining away your battery. Chevy’s OnStar with 4G LTE allows you to be as connected in your vehicle as you are anywhere else. Up to 7 smartphones and tablets can be connected at once. This can make roadtrips much more enjoyable as your kids can stay connected and online game while they’re riding (just make sure you’ve disabled in-app purchases from their devices)! All equipped vehicles have a complementary data trial period of 3 months or 3GB of data. This is tied to the MyLink radios and is available on the Work Truck (WT) trim level; standard on LT and Z71 trim levels. You can check out more information on OnStar’s website. There are currently two powertrain choices for the Colorado with a third, diesel option next year. Standard for all trim levels in Extended Cab and 2WD short box crew cab is the 2.5L I4 rated at 200 horsepower and 191 lb.-ft of torque. Most versions of the Crew Cab require the upgraded 3.6L V6 rated at 305 horsepower and 269 lb.-ft of torque. Both engines have some high tech features to help get more power and fuel economy. We touched on a few of these in the last section but there was a lot of attention in this aspect of engineering so a few of them may pop back up here. Chevy took steps to drastically reduce the mass without compromising safety (as the last section will touch on) in the body and the frame of the vehicle. Colorado features an Electric Power Steering system which removes weight inherent in hydraulic power steering systems. Specific engine components were integrated to do more than one job to further reduce weight. In addition to the mass reduction, composite materials were used to further decrease the weight the vehicle has to move day-to-day. Colorado’s aerodynamics are excellently designed to help it cut through air with minimal turbulence. Features a Segment-First active aero-shutters that close off the radiator when cooling air is not required. The front air dam is removable for off-roading but while attached will help control and smooth the airflow under the vehicle, especially at highway speeds. Safety my appear last on this list but don’t take that to mean that it was the final consideration on this truck. I can tell you that, especially in light of past developments where safety was an afterthought, General Motors has become most likely the most serious automaker when it comes to safety. Below are some of the pieces of technology and features you’ll have on most Colorados. Occupant Ejection Mitigation Feature. Sounds scary I’ll admit. You know what’s scarier? Not having it. This feature works with the head curtain side impact air bags to help hold passengers in the vehicle in the event of a rollover accident. Several structural enhancements have been made to make the Colorado even safer with a higher percentage use of high strength steel. 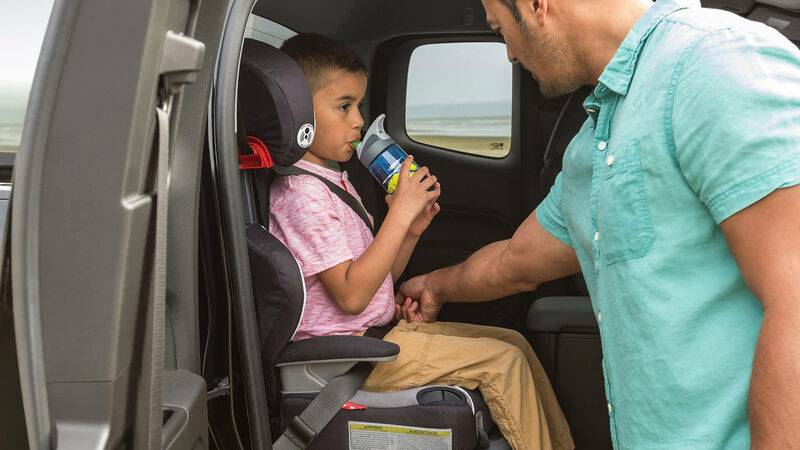 And since Chevy expects that the Colorado will be popular among families with young children they have made several accommodations for forward facing child seats in the rear seat of the Extended and Crew Cabs. Well, that was a mouthful. I hope you’ve enjoyed getting the information about the 2015 Chevy Colorado Class Winning and Leading Techonology… and stuff. Maybe in light of all this technology, and stuff, on the Colorado we can forgive Rikk Wilde for being so awkward? Or maybe not. Either way though, the 2015 Chevy Colorado is definitely worth the attention its getting. If you haven’t received the opportunity to wrap your very own hands around the steering wheel of the new 2015 Chevy Colorado or sat in the seats to experience the technology and stuff than do yourself a favor and give our World Class Internet Department a call today at (800) 680-0835 to schedule your test drive.